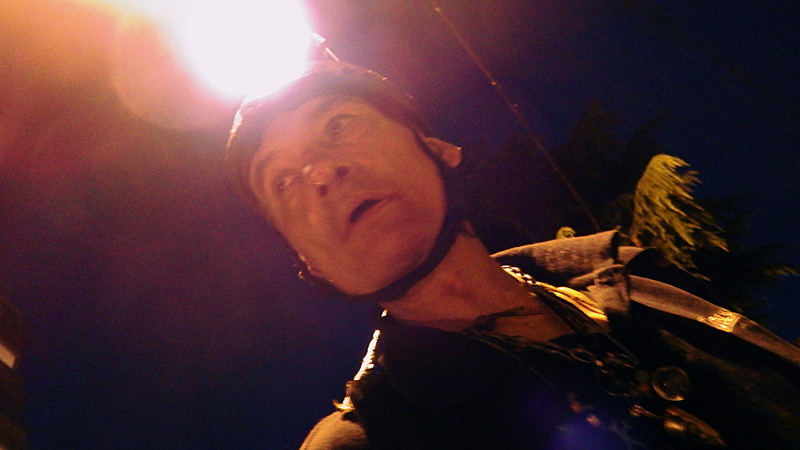 DIY headlamp, dumpster diving, homelessness, Vancouver B.C. 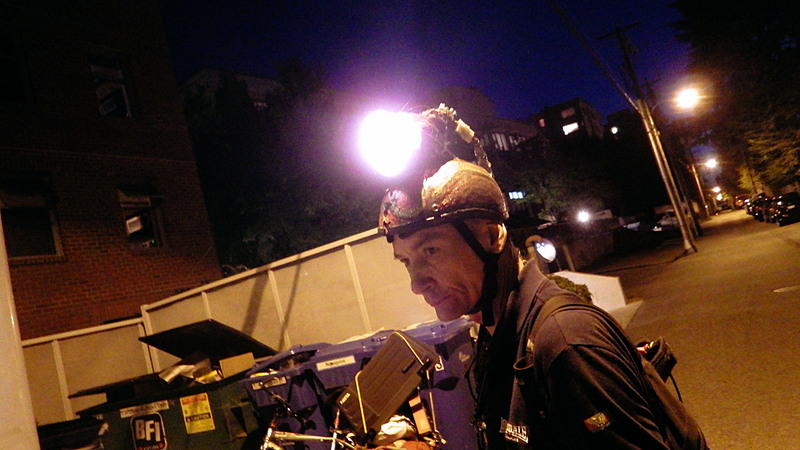 On Monday evening I saw my friend Jimmy — he was making one of his rare binning forays through the back alleys of Fairview and he was beaming — literally. “Mr. 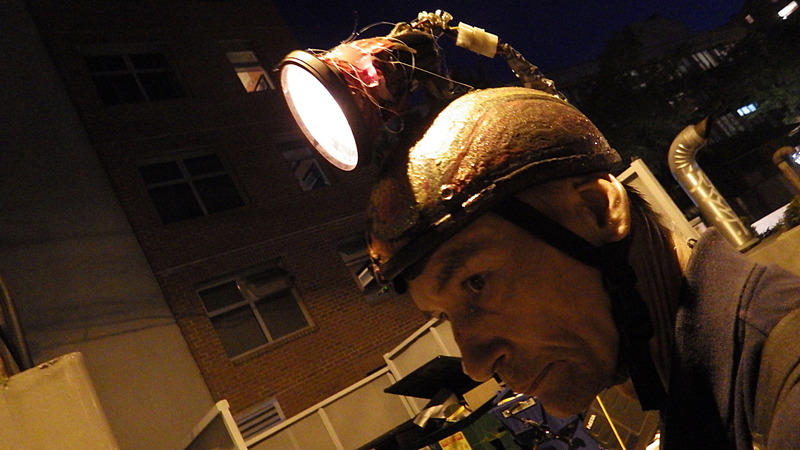 Fixit” had mickey-moused a head-mounted incandescent flood-lamp to guide his way. He’d even wired in a custom taillight on the back of the helmet, though it wasn’t evident at first glance. “Is it on? It’s not on? he asked as he joggled and tapped his helmet rig until the little blue and red LEDs jittered to life. Jimmy looked like a high tech Victorian spelunker from the 1870s — like an adventurous inventor out of a Tom Swift novel. He’s so authentic. He’s got cyberpunk down cold and he doesn’t even know what it is. Such a shining character our Jimmy! Are friends electric? Some of mine are. Jimmy’s very handy. He may be the handiest binner I know, which is saying something. Building bike trailers out of found items; trailer hitches out of office chair wheels — all par for the course. So running into Jimmy can be an impromptu master class in handiness. He explained to me the details of how he built the headlamp: the kind of bulb; the battery; how it was wired — I really didn’t pay attention. I was too dazzled, figuratively and literally. Suffice it to say that if a motor was involved he hand-wound the copper windings and any vacuum tubes were made from wee spice bottles plucked from the garbage and evacuated of air using a modified tire pump. I really should have made notes. There was certainly enough light. Jimmy had been a homeless binner for years when I first met him in in a back alley in 2004. Back in the day he would have been one of the pioneer bike and trailer binners. He always impressed me with his work ethic and his self-reliant spirit. Many people took him to be a loud-mouthed, opinionated, aggressive A-hole. I saw him as forthright, honest and always willing to stand up for himself. People who took the manner for the whole man missed the fact of Jimmy’s intelligence and good heart. And I think he played up the “loose cannon” thing a bit for effect. He could be remarkably canny the way he conducted himself as a homeless person. I never forget that he quietly squatted in a deserted Shaughnessy mansion for something like a whole year and his rich neighbours, who all figured out he was there, never called the police or otherwise expressed any concern about the hobo in their midst. When a police patrol happened on him one evening they were suitably impressed. You would have been too if you knew how the residents of Shaughnessy tend to “interface” with homeless binners. Now Jimmy lives in the Downtown Eastside on government disability and is semi-retired from binning. Actually, two things can’t be said of Jimmy: that he’s either shy or retiring, so let’s just say he’s slowed down a bit. But only a bit. Asking a long-time homeless binner to stay inside on a warm summer’s evening is like asking a politician not to make a speech of it. It took him some years to settle into a good routine down there in drug town — living in the Downtown Eastside is not necessarily better than being homeless in Fairview. But these days he’s a happier and more mellow person. He wasn’t actually joking when he told me he’d recently been decertified (apparently in B.C. you can be certified for being crazy like a fox). The defensive hostility he wore like armour when he was homeless is largely a thing of the past. I’m happy to say now that Jimmy has been able to let his guard down, his excellent character shines through for all to see. Click the images to enlarge them.